removal and examination, usually microscopic, of tissue from the living body, often to determine whether a tumor is malignant or benign; biopsies are also done for diagnosis of disease processes such as infections. 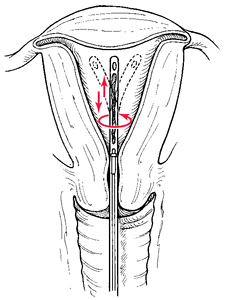 Technique for endometrial biopsy. Longitudinal strips of the endometrium are sampled using an in-and-out and rotational motion. From Rakel, 2000.
aspiration biopsy one in which tissue is obtained by application of suction through a needle attached to a syringe. brush biopsy one in which the sample is obtained by a brush with stiff bristles introduced through an endoscope, such as for a tissue sample from an inaccessible place such as the renal pelvis or bronchus. chorionic villus biopsy chorionic villus sampling. cone biopsy one in which an inverted cone of tissue is excised, as from the uterine cervix. endoscopic biopsy removal of tissue by instruments inserted through an endoscope. excisional biopsy removal of biopsy tissue by surgical cutting, such as a lumpectomy. fine-needle aspiration biopsy aspiration biopsy using a fine needle. For superficial tissue such as the thyroid, breast, or prostate the needle is unguided, but for deep tissue it must be guided radiologically. incisional biopsy biopsy of a selected portion of a lesion. needle biopsy (percutaneous biopsy) one in which tissue is obtained by insertion through the skin of a special type of needle (see biopsy needle). punch biopsy one in which tissue is obtained by a punch-type instrument. sentinel node biopsy biopsy of a sentinel node (the first lymph node to receive lymphatic drainage from a malignant tumor). It is identified as follows: a dye and a radioactive substance are injected into the body, which causes certain nodes to “light up” like a sentinel, indicating that they are the most appropriate ones for examination. They are detected by both the light created by the dye and the radioactive substance that is monitored by a gamma camera. If the sentinel nodes do not contain malignant cells, this usually eliminates the need for removal of more distal nodes. Called also intraoperative lymphatic mapping. shave biopsy biopsy of a skin lesion by excising it with a cut parallel to the surface of the surrounding skin. stereotactic biopsy biopsy of the brain using a stereotactic technique to locate the biopsy site. This can be done as a minimally invasive surgery technique. The patient's head is held in a special rigid frame so that a probe can be directed into the brain through a small hole in the skull. sternal biopsy biopsy of bone marrow of the sternum removed by puncture or trephining; see also sternal puncture. any method in which the specimen for biopsy is removed by aspirating it through an appropriate needle or trocar that pierces the skin, or the external surface of an organ, and into the underlying tissue to be examined. the removal of living tissue, for microscopic examination, by suction through a fine needle attached to a syringe. The procedure is used primarily to obtain cells from a lesion containing fluid or when fluid is formed in a serous cavity. See also cytology, needle biopsy. Fine-needle aspiration biopsy, see there. Any method in which the specimen for biopsy is removed by aspirating it through an appropriate needle or trocar that pierces the skin, or the external surface of an organ. A tissue sample removed from the body for microscopic examination, usually to establish a diagnosis. The tissue can be obtained surgically or by aspiration. The procedure can be guided by computed tomography, ultrasonography, magnetic resonance imaging, or radiography, or it can be performed without imaging, i.e., “blindly”. A biopsy taken without radiographic guidance or strong evidence of localized disease. The removal of cells from an organ by rubbing them loose. Removal of a cone shaped piece of tissue from the uterine cervix to diagnose or treat cervical diseases. The procedure may be performed with a scalpel, carbon dioxide (CO2) laser, or Loop Electrosurgical Excision Procedure (LEEP). The removal of a sample of uterine endometrium for microscopic study. The procedure is commonly used in fertility assessment to confirm ovulation and to determine the cause of dysfunctional or postmenopausal bleeding. The removal of cells or tissue through a long, narrow-gauge needle with or without radiological guidance. 1. The percutaneous removal of tissue from the liver with a large-bore needle that captures a core of tissue. 2. A wedge of the liver obtained during laparotomy or laparoscopy. The removal of muscle tissue for microscopic examination and chemical analysis. The withdrawal of fluid or tissue by means of negative pressure applied with needle and syringe. Use of a directional, high-speed, rotating cutter attached to a vacuum source to gather multiple contiguous core samples of breast tissue through a single point of insertion. This minimally invasive procedure is usually performed under local anesthesia, using stereotactic imaging or real-time ultrasonography. Obtaining renal tissue for analysis with a needle inserted through the skin, usually done after the kidney has been localized by ultrasound, computed tomography, or angiography. This technique is used to establish a diagnosis of renal dysfunction, determine prognosis in patients with renal disease, evaluate the extent of renal injury, and determine appropriate therapy. The most common complication is urinary bleeding, which tends to clear gradually over several days. 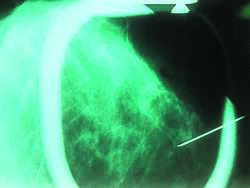 Use of a radiographically guided aspiration needle to obtain a sample of tissue in cases of suspected pulmonary malignancies or other unknown lesions. Because of the risk of pneumothorax, the procedure is usually contraindicated in patients receiving mechanical ventilation. The removal of a small piece of tissue (usually of the skin) with a hollow, round cutting tool. A technique for identifying the initial site of cancer metastasis. After injection of a radioactive tracer directly into the tumor mass, the tissue is massaged to encourage uptake of tracer by lymphatic vessels. A negative biopsy of the first node infiltrated by the tracer suggests that the malignancy has not yet spread to neighboring regional lymph nodes. Removal of a shallow layer of skin with a cutting instrument, e.g., a scalpel, sawing parallel to the skin surface. A shave biopsy may leave a small depression in the skin. It should not be used to remove lesions suspected for melanoma or lesions that seem to have significant depth. A technique for obtaining tissue by aspiration, e.g., to obtain tissue from the mucosa of the stomach and intestines. A biopsy technique in which a hypodermic probe is placed through the skin into an organ of the body (such as the breast), and negative pressure is used to draw one or more samples into a chamber, where they are captured and removed for analysis under a microscope. The removal of cells in fluid or tissue from a mass or cyst using a needle for microscopic examination and diagnosis. Method in which the specimen for biopsy is removed by aspirating it through an appropriate needle or trocar that pierces the skin. 1. the act of inhaling. Pathological aspiration of vomitus or mucus into the respiratory tract may occur when a patient is unconscious or under the effects of a general anesthetic. 2. removal of fluids or gases from a cavity by the aid of suction. is the result of inhalation or aspiration of infected solid or liquid material into the lungs. Large volumes of aspirate cause asphyxia, smaller amounts cause a necrotic or gangrenous pneumonia, in anterior and ventral parts of the lung. There is profound toxemia, cough, gurgling or squeaky rales, and usually an attendant pleurisy producing a friction rub. Called also inhalation pneumonia. Handbook of fine needle aspiration biopsy cytology. For example, patients who are taking anticoagulants generally are not good candidates for core biopsy with SBB, and a fine-needle aspiration biopsy that uses another localization method may be the preferred methodology for these patients. B, On fine-needle aspiration biopsy, there were lymphocytes and histiocytes with emperipolesis (modified Giemsa, original magnification 340). Diagnostic accuracy of CT fluoroscopy-guided needle aspiration biopsy of ground-glass opacity pulmonary lesions. Fine-needle aspiration biopsy, physical examination and mammography, comprise a diagnostic triad known as the Triple Test. Fine needle aspiration biopsy of thyroid nodules, advantages, limitations, and effect. Lymphadenopathy and aspiration biopsy cytology review of 376 superficial lymph nodes. Moreover, in our hospitals, pathologists personally perform cytologic biopsies, such as thyroid or lymph node fine-needle aspiration biopsy, and histologic sampling, such as breast core needle biopsy. Fine-needle aspiration biopsy (FNAB) of thyroid nodules has long been established as an effective, reliable, and safe procedure causing minor discomfort and slight temporary pain (1). In a euthyroid patient with a multinodular goiter, the most appropriate initial approach is fine-needle aspiration biopsy of the dominant or largest nodule, Sarah Kwong, M.
How many biopsies are enough in patient with multinodular goiter? A 4-year-old boy who presented with back pain that prevented him from walking underwent x-rays, bone scans, blood cultures, spinal MRI, and CT-guided fine-needle aspiration biopsy of the vertebrae--all with negative results.